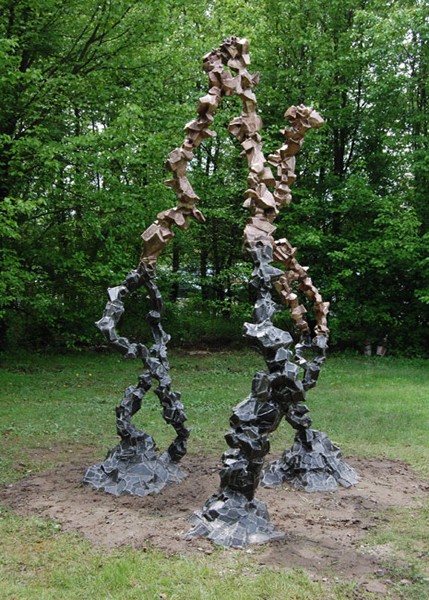 A native of Westchester, New York, Usher earned a BFA in Sculpture from SUNY Purchase College of Art and Design, and is currently working on a Master’s Degree of Fine Art in Sculpture. The Greenburgh Public Library in Elmsford, New York will be exhibiting Usher’s work through Spring 2012 and I highly encourage all of you to get out there and experience this wonderfully talented local artist. I have to say that I prefer his abstractions over his portrait work, but sometimes we have to leave behind what we have mastered in order to gain insight from something that gives us a greater challenge. I am excited to see what he will bring to the art world after he has completed his education, as he has already given so much thus far. His Infinite Wanderings Through Strange Places has notes of Umberto Boccioni’s Unique Forms of Continuity in Space, which is one of my favorite sculptural pieces, so Usher’s work makes me hopeful for the way he will be moving the sculptural community and inspiring the “next big thing” What’s really amazing is the chance to see so many of his pieces on display locally and for free. We hope to see you there!